Sometimes, you will have to regularly update the SAS tables in your system. You will have to insert new rows, update particular fields or even delete rows from the table. These can all be done using the SQL procedure. There is a new walk-in client coming in today. 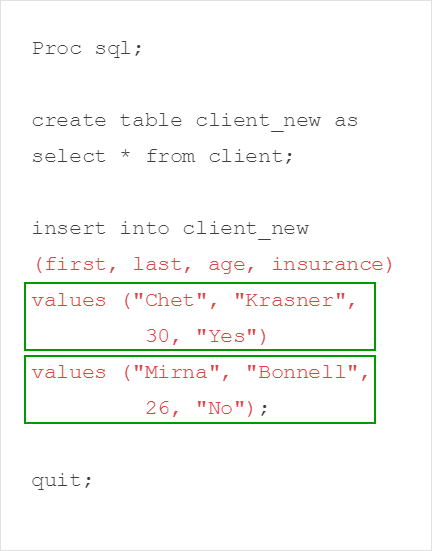 You'd like to insert a new row into the table for this new client. 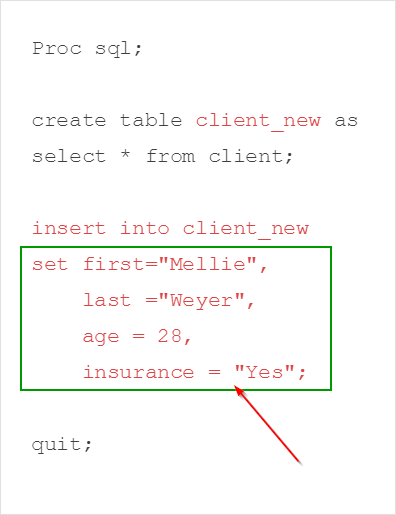 We will first copy the CLIENT table into the CLIENT_NEW table. Finally, the SET clause specifies the values for each column to be inserted into the table. 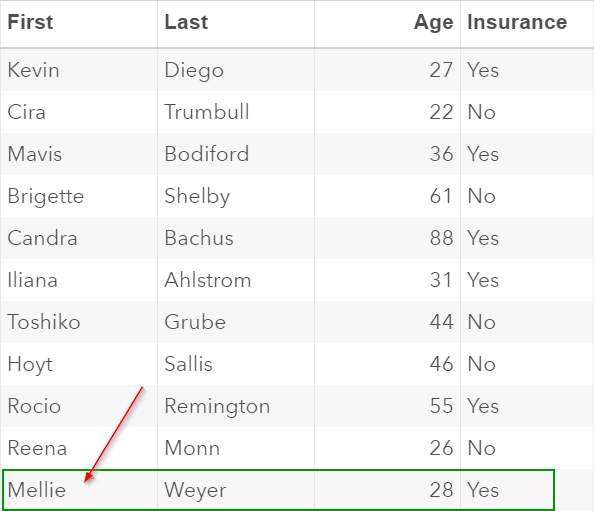 You can also insert multiple rows of data into a SAS table using multiple SET clauses. 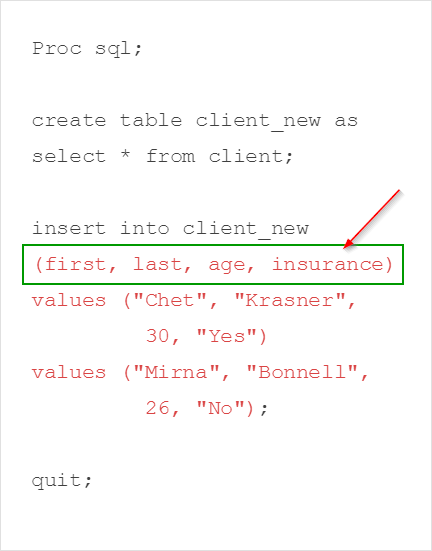 In this example, the INSERT statement contains two SET clauses. Each clause inserts a new row into the table. Another way to insert rows into a SAS table is to use the VALUES clause. 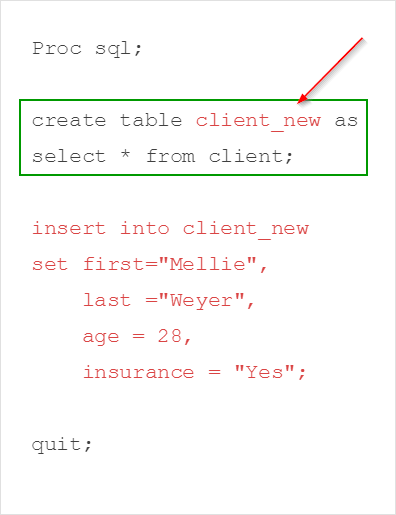 Finally, you can also insert rows into the table using Proc SQL query. The WALKIN table contains two new walk-in clients to be inserted into the CLIENT_NEW table. 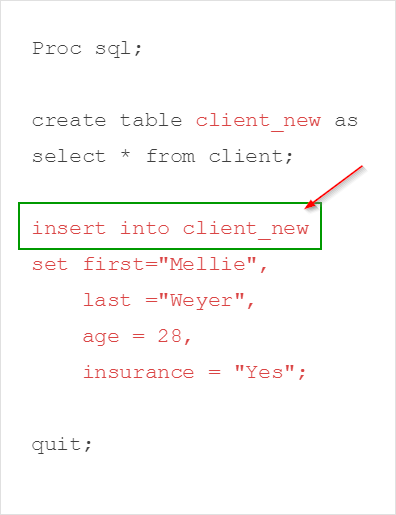 We will now insert these new clients into the table, again using the INSERT INTO statement. 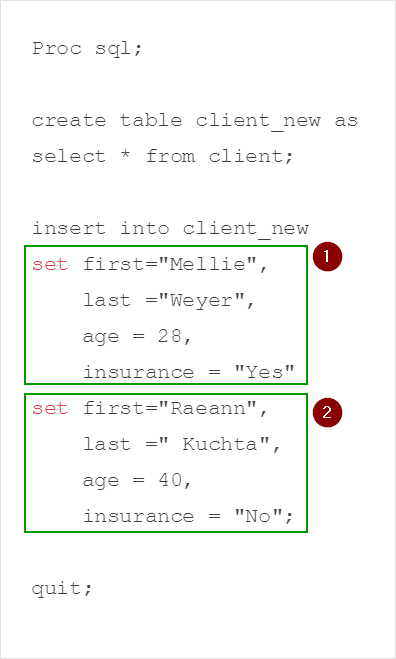 In the next few sections, you will learn how to update rows, and delete rows from a table. The EMPLOYEE table contains a list of current employees. The NEWHIRE table contains two new hires. Insert the new hires into the EMPLOYEE table. The starting annual salary for the two new hires is $50,000. Both are expected to start on January 1, 2017.